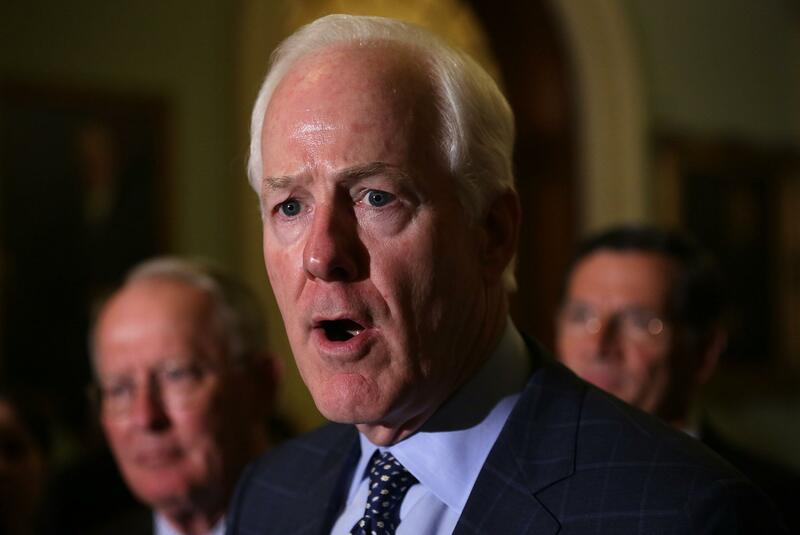 When the U.S. Senate took up the final tax bill Tuesday, more than one-quarter of all GOP senators were voting on a bill that includes a special provision that could give them a new tax cut through their real estate shell companies, according to federal records reviewed by International Business Times. 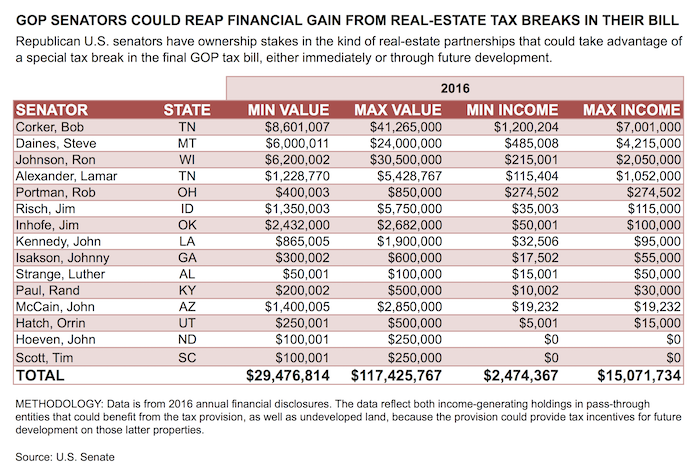 More than a dozen Republican senators (along with their spouses) hold financial interests in over 30 real-estate-related partnerships — worth as much as $117 million in total. Most of the holdings are income-generating investments — and those holdings together produced between $2.5 million and $15.1 million in rent and interest income in 2016, according to federal records. IBT first reported on the tax carve-out, which allows investors in “pass-through” entities, including real-estate partnerships such as LLCs and LPs, with few employees to deduct part of their income that passes through those partnerships. In response to IBT’s reporting, Republican Sen. Bob Corker, whose disclosure forms list up to $41 million in “pass-through” real-estate partnerships, claimed he did not know of the carve-out when he announced his support for the legislation on Friday, after previously casting the only Republican vote against the bill in the Senate, which did not then include the provision. Corker, the Senate’s fourth richest member in 2015, with an estimated net worth of over $69 million, reported the highest 2016 income from real-estate partnerships — up to $7 million — among GOP senators. His income came from three properties held by LLCs that together were worth as much as $35 million. Montana Sen. Steve Daines, whose estimated net worth was $14.4 million in 2015, reported earning between $485,000 and $4.2 million last year in rental income from eight properties managed by Genesis LLC. Daines, with Wisconsin Sen. Ron Johnson, pushed for a more generous tax deduction for pass-through entities during the Senate tax bill process. 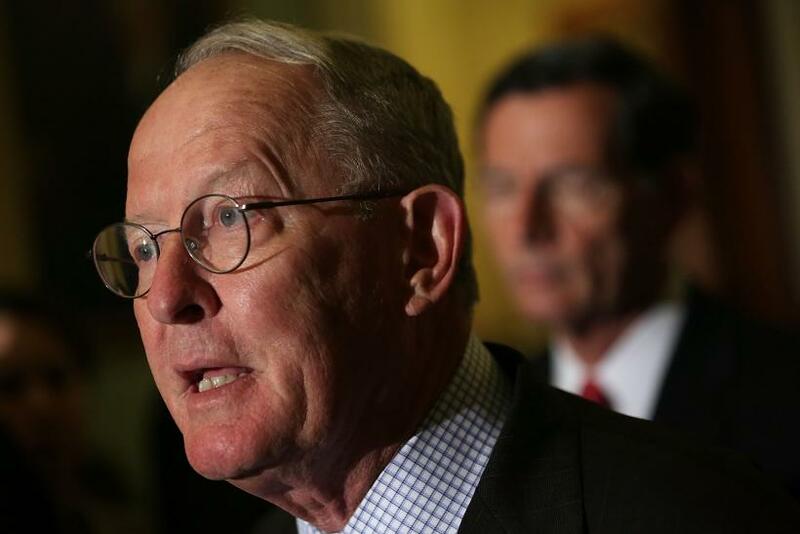 Other top earners were Johnson and Tennessee Sen. Lamar Alexander, who earned as much as $2 million and $1 million, respectively, in 2016 from real estate pass-through vehicles. Beyond Republican senators, another major beneficiary of the provision could be President Donald Trump, who owns or directs over 560 companies, most of which are LLCs or LPs. Some lawmakers’ holdings are in undeveloped parcels of land, and would not necessarily reap the provision’s tax benefits when the bill becomes law. However, the provision could provide a lucrative tax incentive to develop the holdings into income-generating properties in the future — the kind that could then take advantage of the tax change. Democrats in recent days have seized on the provision — and its potential benefits to Republican lawmakers — in demanding the bill be halted. UPDATE, 12/20, 6:25 p.m.: This article originally included Sen. John Barrasso on the list of senators affected by the provision. His office has said the lawmaker recently divested from pass-through entities. Data about Sen. John Hoeven has been revised to reflect that he recently divested from one partnership, and his farm rental properties would not currently benefit from the provision. After further reporting, additional Republican senators have been added, and the data has been revised to reflect these changes. The story also reflects that the Senate approved the bill Tuesday.